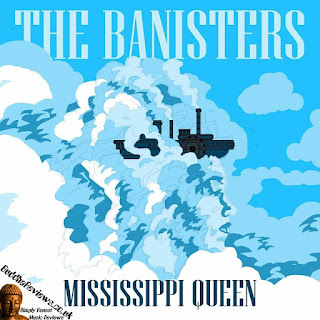 The Banisters are, in their own words, a 'Roots Rock Revival' band from Austin, Texas. Consisting of Nicole Hutchins on Keys & Vocals; Dean Curran on Guitar & Vocals; Jonny Thompson on Bass; Jeff Leech on Drums and Chris DeSilva on Guitar & Vocals. This band was formed in 2015 and they released their debut EP in 2016. Let's see how they have developed their sound since then with this single. Mississippi Queen kicks off with some awesome guitar licks and groovy drumming then the classic rock style, reverb-filled vocals join in. Featuring deep bass, sweet guitar riffs and drums that get you bouncing, this is one awesome rock tune! The lyrics really go well with the music with the vocals and guitar taking the forefront in this song. This is the first time I have heard anything from The Banisters and I must say that I am impressed. I listen to a fair amount of music coming out of America and it's not all as well produced as this song. If all of their music is of the same level of energy, I will be more than happy to buy their first full-length album that is due to be released later in 2018. This single was released on 4th June 2018 and is available from all digital outlets and on Spotify.